He had great stage presence from his drama background. Because he used a pickup on the violin he could move around a lot using exaggerated elbow movements and all kinds of histrionics. As I mentioned before to you, I am interested in the band's history, you all started in Bristol didn't you? I met Dave at Bristol when he was doing a post graduate year and he came to see me play in a jazz club and said he'd like to play with me. We were then in jazz quintet with guys from Bristol University and did a gig for BBC's Late Night Line Up in 1967. I realised we couldn’t make a living at this. Then I met Geoff in a trio with sax and trumpet doing soul stuff like Midnight Hour. Dave though had never heard any rock music. He'd been teaching English as a foreign language for a year in Saudi Arabia, came home with a load of money and had a large collection of jazz LPs. So we formed a band round Geoff, Dave and myself doing covers initially, things like My Girl, basic soul stuff and John Mayall songs, then we all started listening to Hendrix and Cream...this was all new to Dave Arbus! Dave went to Paris and saw Jean-Luc Ponty play the violin with a pick-up on it and he realised he could put one on his. He was a brilliant musician and I saw him play Bartok in a university string quartet. So we brought the violin in and still had trumpet and sax. But at that time I didn’t want to go down the blues route, I saw us more influenced by West Coast music or saw us going down the road of Captain Beefheart and Frank Zappa. We also thought we should write our own stuff so I penned a few songs and we started gigging in a reggae club in Bristol. We became influenced by the likes of the Ska-talites but doing ska without the back beat in a different way which evolved into our own kind of material. We were called that because of the violin in the band then we had a gig in Bristol at the Theatre Royal and the director at the theatre suggested we changed our name and came up with The Picture of Dorian Gray, from the Oscar Wilde novel. So we went with that, but wanted to change it again. I don't really know how we became East of Eden but I didn't really like the name. I don't think that's a bad name at all. On our first album, Mercator Projected, which was our attempt at a concept album. The producer's idea was to put this projection of a world map over a woman on the album cover. On the second album Situation Normal All Fucked Up (SNAFU), it was our idea to have the woman playing the violin on the cover photo. The cover on the French release was a Ford Transit in a bottle rather than a ship in the bottle. This was an idea of ours to reflect life on the road all over Europe. We did a gig in the Hook of Holland on the back of the King of Siam single...for one gig we got paid £50 which in context was a month's wages for me as an art teacher at the time. We thought this was good, so we flew back and realised that the £50 had to be divided five ways and the manager took his 30%, so we were’t going to make any money. Later on when we were doing a gig in Hull, some guy came into the dressing room with a violin and started playing an Irish jig and Dave said 'what's that?' - so when we got back to London, Dave found the music to these Irish jigs and the next day, Dave was doing three ji*gs on stage but it was a footnote to the show right at the end. So without knowing it, as Dave Arbus says, we invented Celtic Rock! Who's that guy in The Chieftains? When the single came he called the rest of The Chieftains, and said they had to go professional! John Peel dropped us when that came out. We were doing well in France getting £800 a gig at a festival and then coming back to England and doing £45 gigs. But how Jig a Jig came about, was we were in France and a girl from Decca said we needed to get a single out and she suggested Jig a Jig so we went into the studio and recorded it. When it was released, it actually bombed because it turned out Decca hadn't supported it. So you really weren't a priority to them? No. We had a contract but our manager had no experience of managing in the music business. There was a recent documentary about him and he turned out to be Hattie Jacques' live in boyfriend. He didn't have a cutting edge which was a bone of contention. In terms of playing the trendy places like Middle Earth and such like, we were never part of that élite because we were from Bristol. Yes, we had been booked for some benefit there. The big managers who controlled the scene were the likes of Robert Stigwood or Don Arden.We never did America,because you had to pay so much up front to get on a tour, although Bill Graham saw us in Paris, and said he’d like us to play Fillmore East. I find the practice of 'buy on' downright offensive. Bands like yourselves never stood a chance. And some who did go over ended up playing really small clubs and nobody ever gets to hear about them. It was like Spinal Tap when we were in Europe though. We did a Swiss tour and got invited to the Indian embassy for dinner after they'd seen us play. And High Tide, that was about it. Dave Arbus really looked the part though with the long black jacket, knee high boots, hat and scarf. He really was an actor. Looking back on it we looked like French impressionists - I looked like Gaugin, he looked like Pissarro. It was like something out of a spaghetti western. We were quite theatrical really, running into the audience playing our instruments up and down the aisles On one occasion I dragged someone on stage who blew into my sax whilst I pressed the notes and then we would pick it up and fall back into our routine. The critics of the time said we were like Dada. But we were also improvising more and more. You were a sort of freeform band weren't you, at least then? Yes, but in a pop group context- not supported by Arts Council grants. We were seen as avant garde with the likes of Archie Shepp on the free jazz scene in Paris. But on getting back to England, Radio One wasn't playing us because we weren't on the the playlist. But as I said when Jig a Jig was released, it died a death. But about a year later, Decca hired some young guy called Jonathan King (yes that one) to review the back catalogues and he pulled out Jig a Jig and they released it as a novelty song and this time it was a big hit and got on the playlists. We had left the band by this time and they changed their musical direction. The original vision was lost. I know that after you and Geoff left the band, whilst the musicians were good, you felt it had strayed away from what you had set out to achieve musically didn't you? Yes, but they were still doing some of our old material! Dave Arbus left as well - he'd gone by 1972. Didn't Dave play the violin break on The Who's Baba O'Riley? Yes, that relationship sort of started when Keith Moon sat in on one of our gigs playing congas when we were supporting the Bonzos at the Lyceum. Dave turned down Manfred Mann who offered him good money, although Steve York had already joined him. I think he played Friars with Vinegar Joe. I still talk to Steve, he's living in Mexico now. He played on Marianne Faithfull's Broken English album and moved to the States. He was only about 19 when he joined us. But this was 40 years ago and I guess you're looking back down the telescope called hindsight. The audiences didn't know what to expect. 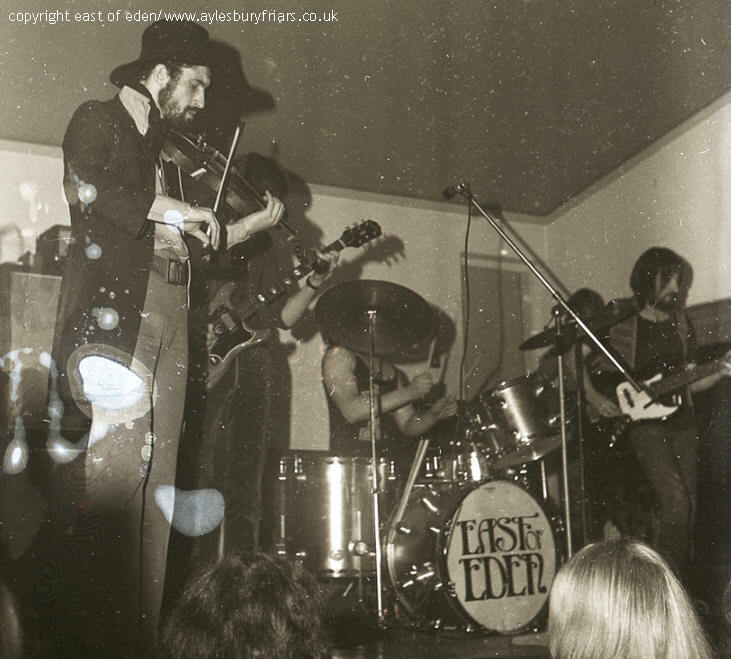 We had built up an audience, around this time we had been doing about 200+ gigs a year all over the UK and Europe. But you had to have radio to reach an audience and we didn't get played. And also by being written about. I think about all we had was a column written about us by Richard Williams (Melody Maker) but we never got a front page or anything like that. We never got promoted. It was filmed and ended up in cinemas...known as the French Woodstock apparently. It was a pretty bad film but we were in it. That festival ended up being in Belgium as the authorities wouldn't allow it to take place in the end and it took place in a tent in a village. The whole film must exist somewhere but bits of it are on YouTube. We've searched high and low. I believe that was actually the first rock festival in Europe. We also did a lot of television and radio in France. Paris based BYG records, who had Don Cherry, Chick Corea etc, offered us £50,000 to sign, but we were already signed to Deram. BYG Records did go bankrupt six months later. Yes, but signing to them might have given us funds to live in France. After you left East of Eden, I know Geoff you have aside from gigging been an illustrator and Ron you have gigged and returned to your art, but I know when we first spoke about Friars about four years ago, a full [modern day] reunion was on the cards, but went slightly belly up, what happened? It actually started off about 20 years ago when we all met up again for the first time and we recorded three albums, it was Dave, Ron and myself with a couple of extra musicians. But just over a year ago somebody approached Dave Arbus to get East of Eden back up and running to do a European tour. Dave was fairly keen as it was a lucrative offer, but it took so long to organise, we realised it wasn't such a good idea. Dave, basically, pulled out at the last minute and we weren't prepared to take the risk. It was all a bit scary and we would have had to be on a tour bus. Geoff Britton, the original drummer was on board and we did some rehearsals my place, the four of us, and it was pretty good. We thought there was still some sparkle there! Geoff lives in Spain and occasionally comes over and I have played with him at some blues jams. Geoff went on to play with Wings after East of Eden. He played on the Speed of Sound album. As Geoff tells it he was asked to go to an audition and he was watching some of the other auditions, drummers he admired, but he got the gig over the cream of London session musicians. Paul McCartney realised he was that good. He was fit strong bloke, full of energy on stage. I gig all the time in blues bands and Ron plays lots of jazz. Dave recently published a book of line drawings of French Chateaux. He nowadays plays Stephane Grapelli type of music I believe. It was just six gigs in Europe -Berlin, Paris, Amsterdam and a couple in Germany, but the promoter didn't fill us with confidence as he wasn't very experienced. He’d seen Dave Arbus' website and that's how the contact was made, no-one got in touch with us. When Dave contacted us about the promoter's offer, it was the first time he had shown any interest in reuniting. The record company that re-released Mercator and Snafu was run by a guy who was Caravan's manager. He said he could get us some gigs but then Dave didn't seem to be interested. The last time I spoke to Dave, he thought me might be going to live in Morocco. We could get you three original members (myself, Ron and Geoff Britton) if you really want to get a version of East of Eden back in Aylesbury! I know a suitable violinist and bass player. I suppose we could go out as Beast of Sweden with a guest violinist. Or even East of Neasden! Gentlemen, thank you so much for talking to us and best wishes from all at Friars Aylesbury. This interview and its content are © 2012 Mike O'Connor/www.aylesburyfriars.co.uk and may not be used in whole or in part without permission.